Draping technique is the technique which means the way of fabric hanging. The method of draping includes stitching the garment by the use of loosely hanging material to create o flowing effect. Even it can create for a very impressive effect when finished appropriately. Draping needs ability and practice to do exact fitting, fall and fullness. Most of the designers choose to try out with the mode of fabric hangings but also there are purpose-able ways to determine drape. Draping technique is generally used in making garments but can also be used to develop skirts, blouses and pants. # Draping at first started with a designer, taking a normal basic dress and putting it on a dressmaker’s model. Already the garment was sewn before starting draping. While stitching the garment, core shape and fit should be maintained properly to dress-up the model perfect. # The next technique is, the designer takes pieces of fabric, pins and required material before starting draping. Pin them to the garment where the drape is preferred, which will provide the finished garment shape. Most of the time, the pinned fabrics were not the same as the fabric which was used on the final garment but they will be using comparable priceless materials….. The reason is that the fabric which was pinned on the garment will frequently be slashing or marked on while the design process is going. It can be costly with well cloths. After the designer has made the garment appearing the way that the model requests it, the model will create final marks on the fabrics to explain where the slashes and sewn should be made on the concluded garment and then the fabric pieces will be removed. Designer will take the pieces and trace them on the paper to create a pattern for the final garment. This will be used to guide for making the garment, so it is so important for the designer to make detailed marks on the performed fabric. 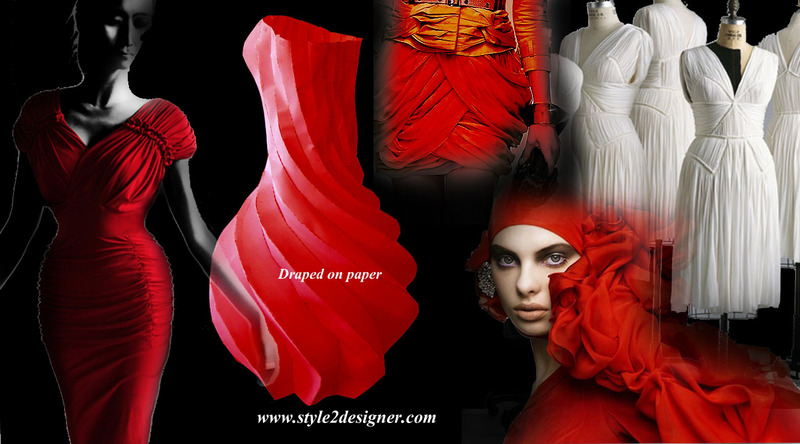 Designers have to consider lot of aspects when they are draping the fabrics. The material and GSM of a fabric can significantly modify the way it drapes on a garment. The materials like chiffon, satin and silk are rather usually consider in draped clothing. Some other materials can also be used as well. More inflexible fabrics are unsuitable for this draping effect. However most of the designers would have a preference to experiment with fabrics to check how they hang. There are some specific ways to check the fabric’s draping mode. This can be over either by identifying the thickness and stiffness of a fabric sample or the method of using a tool called as drape mater. Drape meter was used to determine a drape coefficient. It contains a number from 0 to 100 in written format. For example, sateen and muslin cloths have good draping property than twill hosieries. its brilliant nd very helpfull.. I want to learn this, is it possible ? How? is there any jobs for draping? Pls,how can I purshase the CAD software?